The Optoma EH515 is a Full HD professional Installation projector, ideal for corporate environments, houses of worship and Pro-AV installs. EH515 DLP technology provides accurate colors and great contrast for dark and white images. Part of Optoma?s #1 high-definition fixed lens installation family of projectors, the EH515 is furnished with advanced features to facilitate quick installation, high brightness and low total cost of ownership. Features include: Four corner correction (ideal for image stacking or uneven walls), Horizontal and Vertical Lens shift and Keystone together with x1.8 zoom ratio, permit a quick setup and easy usability from any angle. Full HD (1920 x 1080) has more than twice the resolution of HD Ready (1280 x 720). EH515 is compatible with HDTV broadcasts and high-definition media to project impressive full 1080p images and video in their original digital brilliance. 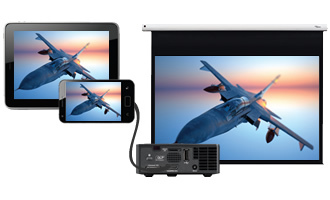 For vibrant, natural looking images, Optoma projectors incorporate BrilliantColor? multi-color processing technology. The UHZ65 is a state-of-the-art 4K Ultra High Definition (UHD) projector for home cinema viewing capable of delivering incredibly sharp images with a high level of detail and breathtaking color. With 4 times the pixels of 1080p, an ultra high resolution of 3840x2160, 3000 lumens, and 2,000,000:1 contrast ratio, the UHZ65 has been engineered to deliver the ultimate 4K UHD home viewing experience. Its powerful laser phosphor light engine, High Dynamic Range in the form of HDR10, vertical lens shift and massive 1.6x Zoom, take image quality and use of the UHZ65 to world class, cinema-quality. The UHZ65 is powered by a revolutionary Texas Instruments 4K DLP UHD chipset with a high performance DMD utilizing XPR video processing technology with fast switching to display 8.3 million ?distinct? pixels as mandated by the Consumer Technology Association's 4K UHD 2160p specification. The UHZ65's PureMotion technology dramatically enhances games, movies, and sports by eliminating noise, motion blur, and erratic movement in fast motion video, producing images that are clear, consistent, and smooth. In terms of at-home installation, a generous 15% vertical lens shift and a massive 1.6x optical zoom provide a great deal of flexibility, while dual stereo speakers generate audio that is loud and crisp. The UHZ65's light source provides a remarkable 20,000 hours, eliminating the need to replace the light source throughout the life of the projector. DLP (Digital Light Processing) is a proprietary technology from Texas Instruments that offers digital projection with higher contrast, faster response time, good pixel structure and virtually no color degradation. output to create a stunning high contrast ratio. Bright scenes appear crisp and clear, while dark scenes remain detailed with deep blacks and exceptional light and shade detail. settings for the ideal viewing experience. Color the way it is meant to be seen ? rich, colorful and cinematic pictures and games via DCI-P3 wide color gamut coverage. Display Technology Single 0.66 TRP S610 4K UHD DMD DLP? Technology by Texas Instruments? Dimensions (W x H x D) 19.6? x 13? x 6? The 1080p Optoma EH615T is a bright 6,200 ANSI lumens projector perfect for professional installations in corporate environments and houses of worship. DLP projection technology ensures accurate colors, excellent contrast and vivid images for an outstanding visual experience. Robust input options on the Optoma EH615T include HDMI with MHL technology and HDBaseT for connectivity to a wide range of high-definition devices and extended cable distances without loss of image fidelity. An Eco+ lamp power management mode enhances energy efficiency for environmentally friendly operation. Dimensions (W x D x H) 16.7? x 6.3? x 13.5? Projection Distance 4.3? - 26.25? The Optoma ProScene ZU660 is the perfect 6000?lumens WUXGA projection solution for?museums, boardrooms, higher education,?house of worship and smaller entertainment?venues. Its low-weight, quiet operation and?interchangeable lens options make it ideal?for professional installations. Laser phosphor lighting technology?eliminates the need for lamp and filter?replacements for 20,000 hours of low-cost?operation. Advanced color matching with?HSG adjustments enables fine-tuning with?multiple projector installations. Robust input options include HDMI, DVI-D,?and VGA for connectivity to a wide range?of devices. HDBaseT enables greater?installation flexible by supporting audio,?video and control over a single CAT6 cable?up to 328-feet long. 3D Compatibility Supports all HDMI 1.4a mandatory 3D formats (frame pack, side-by-side, top-bottom) and up converts frame rate from 60Hz to 120Hz or 24Hz to 144Hz (i.e. 60 or 72 frames per eye). Required 3D glasses are sold separately. Refer to user manual for details. Warranty 3 years or 20,000 hour light source warranty (whichever comes first), 3-year Optoma Express advance exchange warranty on the projector. The WUXGA Optoma WU615T is a bright 6,500 ANSI lumens projector perfect for professional installations in large corporate environments and houses of worship. DLP projection technology ensures accurate colors, excellent contrast and vivid images for an outstanding visual experience. Advanced installation adjustments, like four corner corrections, horizontal and vertical lens-shift and keystone enables quick setup and easy usability from any angle and on uneven surfaces with the Optoma WU615T. The 1.8x zoom lens provides an adjustable 1.2-2.16:1 throw ratio to easily adjust the projected image for flexible installations. Robust input options on the Optoma WU615T include HDMI with MHL technology and HDBaseT for connectivity to a wide range of high-definition devices and extended cable distances without loss of image fidelity. An Eco+ lamp power management mode enhances energy efficiency for environmentally friendly operation.